6 new G+12 towers in British style architecture offering 2 - 4 BHK apartments launched at Zuari Garden City! Standing close to India's most famous garden - The Brindavan Gardens, Zuari Garden City is the first ever integrated residential township in Mysore. It brings you garden homes set amidst exceptional lifestyle facilities. Zuari Garden City is a 74 acre premium project that redefines luxury living in Mysore. Promoted by the Zuari Group, a leading corporate house founded by Dr. K. K. Birla, Zuari Garden City offers multi-storey apartments, grand villas, luxury villas and town houses. 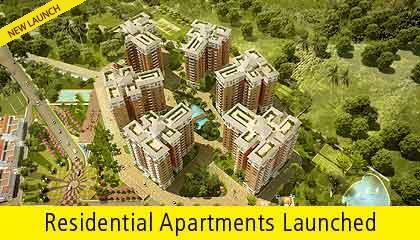 The Apartments at Zuari Garden City are a true blend of luxury and aesthetics. Six blocks of G + 12 towers with more than 80% green Area, the towers at Zuari Garden City are built to British style architecture, with elegant tones of white and brick finishes. It offers 2, 3 and 4 bedroom apartments spanning 1240 - 2335 sq ft. Some premium features include Garden for each apartment, Separate Theme Park for each Block, Fountain in the centre of all Apartment Blocks, Gymnasium in one block and Party hall in an alternative blocks. It also features 2 Basements & 1 Covered Car Park for 2 & 3 BHK & 2 car park for 4 BHK. The Grand Villas at Zuari Garden City offers opulence with aesthetics. The villas are of 5550 sq ft super built-up area, and comes with 5 bedrooms with attached balconies, spacious dining and living spaces, family lounge area, private terrace pool, garden facing wooden deck, store room, separate puja room and separate servant's quarters. The villas also feature free parking spaces for 3 cars. The Luxury Villas at Zuari Garden City radiate a sense of freedom you haven't experienced before. The 3230 sq ft villas offer 3 spacious bedrooms with individual sit-out areas, spacious dining and lounge areas, family lounge area, terrace garden (Optional), exclusive green deck, store room, separate puja room and separate servant's quarters. They also offer free parking spaces for 2 cars. Townhouses at Zuari Garden City blend the classic idea of coziness with world-class design aesthetics. Each unit of 1850 sq ft super built-up area comprises 3 bedrooms, spacious balconies, large living and dining spaces, utility room, puja room and terrace garden (optional). Free Covered parking space are also available.